After the movie last night, we decided to have dinner. There are many good choices in the area around the AMC theater in Torrance. So we decided to try something different. 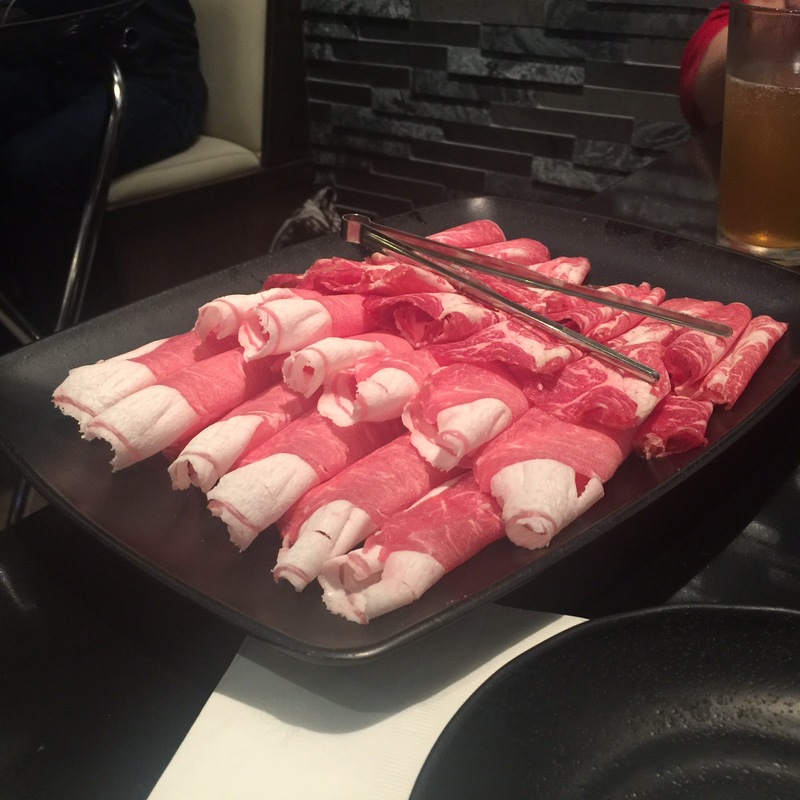 We decided to try the “Little Sheep Mongolian Hot Pot“. So here’s how this works. 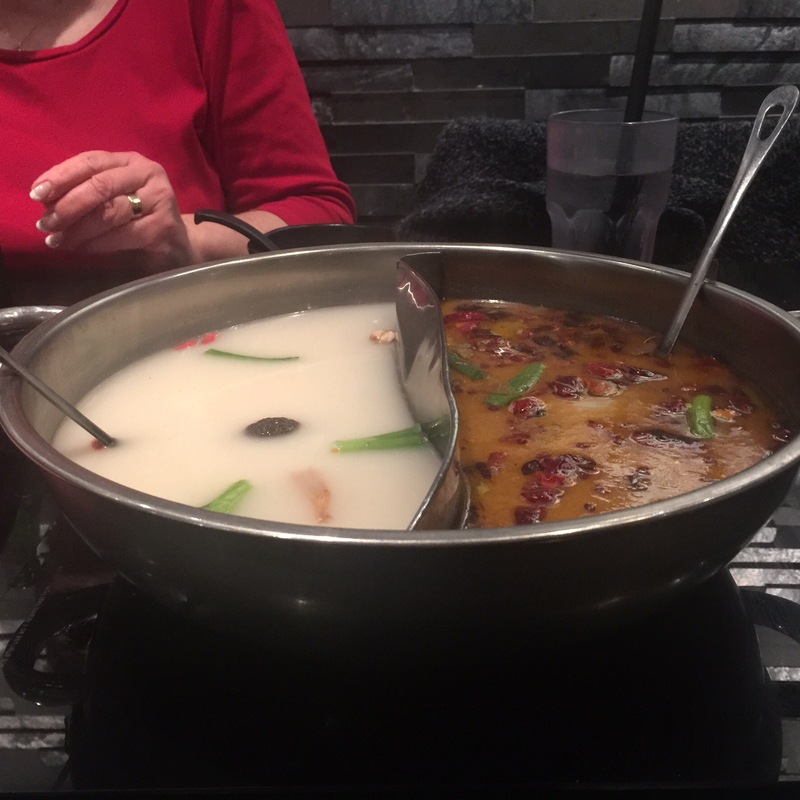 At each table, there is a hot plate located in the center of the table. On the hot plate is placed a bowl of soup broth. First thing that one orders (after you order your beer or wine) is the broth. There are three varieties. Normal, Spicy or a bowl with both the normal and spicy separated by a divider (see picture). We decided to do the libra choice. I wanted the spicy and Paula wanted the bland. Then one chooses the meat, vegetable and/or fish. We decided for a lamb/beef combo and vegetable combo (kale and other green stuff). So you either order stuff ala carte or pay one “All you can eat” price. We did the ala carte because we weren’t quite sure how filling every thing was going to be. So here’s how this works. You take a portion of meat or veg and pick it up an drop into the soup. Let it simmer for a bit, then fish it out with either the soup ladle or your chop sticks. Then eat it. They give you a soup bowl so you can eat or drink some of the soup. The food was tasty and service was good. Somehow, I think this would work better with four or more people. But we were satisfied. Oh, by the way, either bring a bib or don’t wear anything that isn’t washable. You will get soup on your shirt. This entry was posted on February 14, 2016 at 9:01 pm and is filed under California, Food, Reviews. You can subscribe via RSS 2.0 feed to this post's comments.